According to a survey by Evergage and Researchscape International, 96% marketers surveyed agreed that personalization helps advance customer relations. However, 55% also feel that businesses are currently not getting personalization right. Challenges with overall technology and data handling are two of the top five challenges enterprises face, when it comes to delivering effective personalization, as per a 2017 study by Sailthru. So we decided to take a look at five key technological aspects to consider, when it comes to delivering advanced personalization. Effective personalization depends on the right data, and structuring it in a manner that can serve personalization requests. The existing content on your site, or on any of your digital channels, has to be broken down and saved at a granular level. Each concise content snippet/granule should correspond to a particular personalization parameter. This is primarily because personalization for each individual is a unique combination of different parameters, and without granular content you won’t be able to serve the right mix of content that they want. With a huge amount of data to be parsed and processed, how fast can you deliver a personalized experience to the user? You might have created the most carefully curated experience for you customers, but it never reaches them if your systems, especially frontend rendering of the data, is not fast enough. Given these challenges, businesses need to build technology competencies around enterprise search engines like Elasticsearch and Solr. These will be critical in terms of making high-performance digital applications with quick response times. These search engines work well with large volumes of text and can quickly pull all necessary data required for personalization from the server side, while keeping the client side extremely lightweight. This is a simple “if this - then that” logic applied to user actions in order to create personalization workflows. The rules are explicitly stated, and is simple to execute for your systems. Rules-based personalization is an ideal first step for businesses. It can be based on the major user-behavior parameters like location, age, previous pages visited on the site etc. However, the challenge with this approach is that you have to manually cover every single personalization scenario possible. When you are just starting off with personalization, and probably have access to only a limited number of data points, mapping out all personalization opportunities is not a huge task. But as your user base scales, and the amount of data increases, rules-based personalization will begin to fall behind your requirements. This is where complex machine learning (ML) models come into play, parsing through volumes of collected heuristic data to find relevant user patterns and connections. Text and image classification, neural networks, and natural language processing combine to create highly contextual and personalized experiences. These models continuously learn, and hence can modify the personalization as user behaviors change. However, the hurdle that most enterprises face with AI-based personalization is the lack of adequate and accurate training data for the machine learning models. Adding the right tags against users and content pieces is a way to make them easily identifiable, and hence incorporated into the correct personalization workflow. 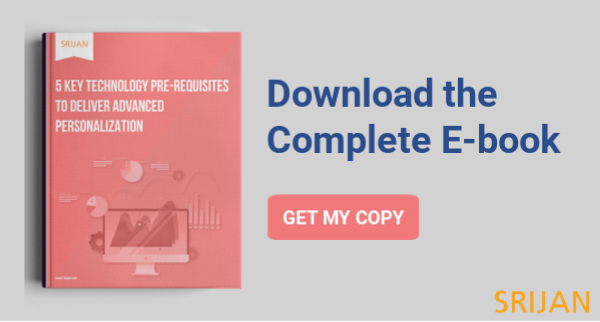 One of the simplest, and also most comprehensive methods to prepare your existing content for personalization. Each piece of content, when tagged correctly with all the relevant parameters, gets served across the right personalization workflows. The objective with tagging is to let your systems know which content pieces can be served for which particular personalization parameters. Businesses should also progressively tag users to create a comprehensive profile. Every time a user visits your site, and performs certain actions, it gives you an opportunity to gain more insights into their behavior. So elements like the content filters they apply, the number times they visit a certain page, the amount of time they spend on a particular section of a page, could all lead to effective tags for their profile. Chatbots are one of the most widely adopted methods to deliver personalized experiences today. But a key question to answer before diving into development is the kind of chatbot you wish to create. The choice is between restrictive and language-based chatbots. A simple conversation interface is where you type in a query and receive an answer but the interaction is restrictive in terms of what you can ask the bot. In this case, complete interaction trees are defined for the chatbot, and the user cannot deviate from that. These chatbots get the job done efficiently, and are focused on task completion. These interfaces are powered by Natural Language Processing, and hence can handle a wide range of conversational diversity. The responses are determined by the bots’ understanding of the users’ question and context, rather than a pre-defined interaction tree. So you don’t have to manually define every conversation scenario for the chatbot to effectively assist your customers. With the amount of data enterprises collect today, they can power tremendous growth, but only if they hone their ability to deliver valuable personalized experiences. And while I have illustrated a few points on here on how enterprises can approach this, our recent ebook takes a more detailed look at how exactly these five technology aspects work to enable effective personalization. How about you take a look?